Be Warm and Comfy with a Microfleece Blanket from BrylaneHome! Everyone loves to be warm and cozy and BrylaneHome can help with that! They have everything you need to make your house cozy, decorate it the way you want in any room and they even have items to spruce up the back yard! In our home we absolutely LOVE the microfleece bedding from BrylaneHome! So much so that after we got a bedding set for my daughter my husband asked me why I didn’t buy us a set. From the microfleece sheets to the comforter it’s all so incredibly cozy and comfortable that sometimes (okay many times) we don’t want to get out of bed! We also like touse the microfleece blankets in our family room which is in the basement and can be a bit chilly but it’s also where we watch movies so the blankets are perfect for this room. Seriously their microfleece is so soft and cozy and they’re all reasonably price too! Below is my daughter’s bedding set from BrylaneHome! 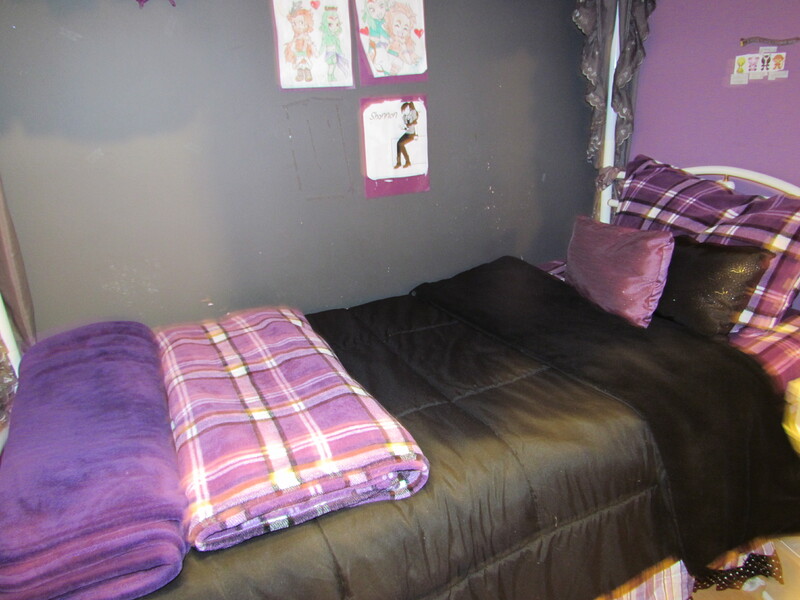 The microfleece blanket is the solid purple one it’s sooo plush but so are the sheets, the plaid on top of the bed is the top sheet! We got our bedding set when there was a sale which BrylaneHome is constantly having sales. Just sign up to be on their email list and you too can score a great deal on this fabulous bedding! Right now is a perfect time to have one of their cozy Microfleece Blankets! They come in a variety of colors and sizes from twin to king size and they are soooo soft and cozy! One lucky reader will receive Microfleece Blanket in their choice of color and size (based on availability). Don’t miss out on this cozy giveaway enter below now before it’s over! I like the Louvre Bath Collection! I would love to have the Tanning Lounger! My BrylaneHome wishlist is a mile long. I would especially like to have the 103 Gallon Rolling Deck Box to store all of my gardening tools. Fingers and I am hoping to win this:-) I really like shopping at Brylane’s site. I love their solar lights, thank you! I really, really want their Iron/Wicker Five Drawer Unit for my lingerie. I’d also love to have their Resin Rocker and all of their outdoor furniture….very nice. Anything for the kitchen – I like the spice carousel! The scarf hangers are so cute and I need one! I really like the outside solar hanging lights. I would love the red stand mixer with 2 bowls. I would love to also get the Plush Extra Wide Recliner With Storage Arms. Cute blankets! I have the flu so the raffle copter seemed overwhelming. Cute webpage! Would love to have the zero gravity chairsI love the colors too. I like the choice of organizers that is offered. I like the Extra Wide Power-Operated Lift Recliner. I like the Three Bin Laundry Sorter. I also like to get the Vortex Mosquito Zapper. They are so annoying! Didn’t even have to look really — I’m all about the Cuisinart 17-Pc. Chef’s Classic Non-Stick Hard Anodized Cookware Set. I also like the Extra Wide Stain-Resistant Pillow-Top Recliner with Storage Arms! Wow, now this is a comfy looking chair, one you could just melt into at the end of the day! i would love to have the zero gravity chair.. it looks *so* comfortable! I really Love the Extra Wide Textured Vinyl 3-Seat SwingItem #: 1588-08193-1340! I didn’t know that they carried out door furniture! I would love to get a Zero Gravity Chair with Canopy!!!! I like BrylaneHome® Studio Quilted Bedspread. The Violets Quilt Set is pretty! It’s spring and the warm weather is coming! The Zero Gravity Chair With Pillow And Canopy looks like the thing to have to enjoy the great outdoors. I like the Plush Extra Wide Recliner With Storage Arms, been looking at it for some time in fact. I rally love the zero gravity outdoor lounge hairs with the pillow and canopy. That canopy comes in really useful. The color changing shower head and a lot of the kitchen items are awesome! I like the Set of 2 Scarf Hangers! I want the Country Kitchen Pantry with Copper Accent. I’m in love with the Panasonic Toaster Oven at Brylane Home. It has so many great features! I really like the Slim Scroll Hamper with Storage! I love the Naples Tree Bench! I ike the Outdoor Glider Chair. I like the Simon Club Chair. I really love the Tiffany Style Butterfly Bench. I would look great in my flower garden. I like the Carrie six piece comforter set. I could also use some new bath towels. My daughter needs a Laundry Sorter in the worst way. I like the Gazebo Lantern String Lights! Thanks for the giveaway! The bedding sets would be great for a Spring change in the house. I like their Hamilton Beach Red Cordless Kettle. I’d like to get the Waring® Meat Grinder. I like the Kitchen Islands. I love the English rose 3pc quilt set, so pretty. I like the 9 shelf organizer. I feel in love with the lawn chairs and all the outdoor things. because my daughter shops online all of the time. I like the Extra Wide Power-Operated Lift Recliner . I would like the 10″ offset umbrella. It would work perfectly on my patio. Would really love some outdoor furniture for our backyard as we don’t have anything except folding chairs, thanks! I Love the Patio furniture especially the Extra Wide Textured Vinyl Outdoor Cushioned Recliner. Its so awesome looking. I love the Orangie Color. This would look good on my Deck.. I really love their over-size bath sheets. I would also like the Cuisinart Coffee Grinder. I like the toaster oven with double burners. They have such great things for the yard!! I love the Translucent Lighted Fountain with Floral Design. I like some of their outdoor furniture. I love the over sized bath sheet! I really like the Office Chair with Flip-Up Arms. I reallllly love the ‘Naples Hall Tree’, it’s an organizer/trunk/coat rack and its gorgeous!!! I realllly love the ‘Naples Hall Tree’! It’s an organizer/coat rack and its gorgeous!!! I really like the extra wide outdoor rocking chairs! I’d love a couple Extra Wide Textured Vinyl Outdoor Cushioned Recliner for our porch! I also like the zero gravity chair. Now that it’s spring, I’d love to have one of those on my patio! I love their “Anna” coffee table. I have been looking around for a new table, and this one is so pretty! I love the wide variety of cast iron cookware that they have. I am obsessed with cast iron! !